Here at Charles Rose we love Rioja. So it was no surprise to us that The Telegraph recently reported that one in twenty of all bottles sold in the UK is Rioja. Spain has more land dedicated to vineyards than any other country in the world, just under 1.2 million hectares. Rioja is a beautiful region with DOC status, sitting just below the Cantabrian Mountains along the Ebro river. 34% of all the wine produced in Rioja ends up in the UK, thats around 36 million litres, 10% more than the previous year! We are Rioja’s biggest export market, with sales of Rioja accounting for £220 million, around 4% of the total UK wine market. Why? Because we love it, and our appetite is growing! The popularity of tapas is on the rise, so says the Telegraph, bringing with it a surge in demand for Rioja. Personally, we think the quality of wines coming out of Rioja have never been better. Renewed interest in Rioja will only bring greater consumption as people discover or rediscover just how good it is. Rioja is also fantastic value for money. Around a third of all the Rioja consumed in the UK is Reserva, which can be as much as ten times cheaper than an equivalent Bordeaux. The Telegraph quite rightly raises the question of whether or not Rioja sales might soon outstrip sales of French wines. Bordeaux has unparalleled heritage, but this comes at a price! A new generation of younger wine consumers faced with a choice between a cheaper Spanish wine and a much more expensive French wine might well save the latter for a special occasion. So if you haven’t yet jumped on board the good ship Rioja, we suggest you join us and pick up a bottle! Cheers! Image is “Viñedo-en-Ventosa-LaRioja” by Jesús García – Propra verko. Licensed under Public Domain via Wikimedia Commons. Ever wondered what the Denominación de Origen Calificada (DOC) statement on the label of a Rioja means? Spain has more land dedicated to vineyards than any other country in the world. In 1932 it introduced laws governing the quality of Spanish wine. Spanish wines are divided into four categories; two that have Quality Wines Produced in a Special Region (QWPSR) status and two that do not. QWPSR is an EU classification which protects the geographical origins of products. It guarantees that Champagne can only be called so if it comes from the Champagne region. Vino de Mesa; literally table wine. The lowest grade available often made from a blend of wines from different regions and can only say ‘Product of Spain’ on the label. Vino de la Tierra – VdlT or VT; indicating wine of the country. Made from wine from a specific region and may use the name of that region on the label. Denominación de Origen – DO; QWPSR status dictates that wines with this classification are sourced from designated wine growing regions and are produced to exacting standards. Denominación de Origen Calificada – DOC / DOCa / DOCq; this is reserved for the DO regions that produce wines of exceptional quality. Only two of the 89 regions in Spain have achieved this, Rioja and Priorat. 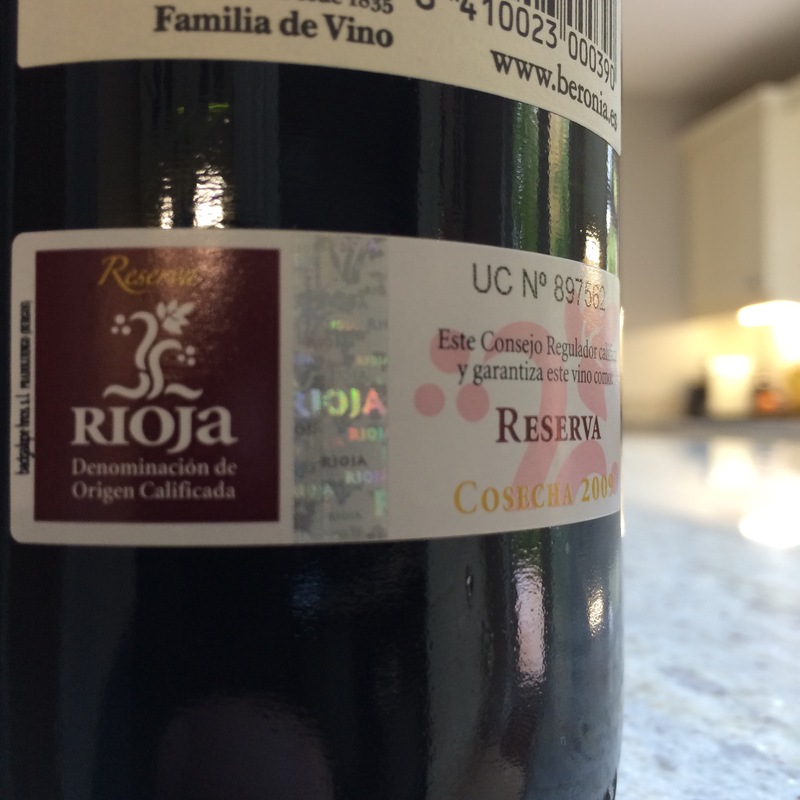 If Rioja is your thing make sure it has a label on it like the one below. If you are interested in Rioja then why not try our Beronia Reserva.